For many people, winter is when our love for running gets cryogenically frozen, to be thawed out when the flowers start blooming. It is cold. It is dark. Sometimes your nose develops two snotsicles and you don’t even care because you can’t feel your face. Honestly, winter can be the pits if you aren’t mentally and physically ready for it. So as the earth tilts towards winter, stay on track by tilting your training plan. Here are 10 commandments to get you through. Unless you live on the Equator, running in winter is going to involve running in the dark. And unless you live in California, it will often involve uncomfortable cold. Trudging five miles in the cold darkness may sound terrible. Running 40 minutes, independent of speed, sounds more doable. If you recalibrate your training to time, rather than distance, running during winter becomes easier to conceptualize and execute. If I had a dime for every time I thought, “Oh, it’s dry out there, I can wear my road shoes,” I would have enough money for the hospital co-pays from my annual slip-and-fall injuries. When the temperature drops below 40 degrees Fahrenheit, assume you will encounter ice without warning, play it safe and wear trail shoes with lugs. Motivation waxes and wanes, especially during winter. My rule: it’s OK to miss one day every once in a while if you are busy or unexcited, but never miss two days unless there is an injury scare (or it is a part of your training plan). An object at rest wants to stay at rest—unless we’re talking about love handles, which always want to jiggle—so try to keep your legs in motion! You never bake a cake without pre-heating the oven. The same principle applies to running. Cold extremities are more injury-prone, so warm up your feet, knees and hips before taking your first running step. In a perfect world, you would run your feet and shins under hot water prior to heading out the door. However, if you’re on the go, dress warmly and do a warm-up routine indoors to get the oven started. Some runners deliberately dress skimpily during winter, as if there is honor in wearing shorts in a snowstorm. And just like in medieval television dramas, when winter is coming, quests for honor often end badly for the honor seekers. Cold muscles, joints, and bones are less resilient and efficient, so always stay warm from the waist down to avoid unnecessary overuse injuries. Cold, icy conditions make it nearly impossible to run fast on flat ground. The goal of flat-ground training is often to improve your velocity at different effort levels (like VO2 max or lactate threshold). If your velocity is lower than it should be, you could be undermining your development (depending on your training plan and goals). Instead, when conditions are slick, do your workouts on uphills. On uphills, velocity is less important than effort, so as long as the effort is there, you are getting the lion’s share of the training stimulus. Hill intervals between 30 seconds and 3 minutes can keep your engine revving so that you can get the most out of flat-ground speed work on days when it thaws out. In the doldrums of winter, it can be easy to grow nostalgic for summertime singletrack—and summer races. However, don’t write checks that your body doesn’t actually want to cash later. Running is hard, and overextending yourself due to an idealized version of what racing entails is a recipe for a crash later. I recommend athletes make big race decisions while running hard uphill at race effort near the end of a training run. If you still want to sign up for the race when your heart rate is sky high and your muscles are searing, then it’s worth doing. If the discomfort makes your motivation wane, you might want to think twice. Baby it’s cold outside, but baby you still need to drink water. It seems simple, but it’s shockingly easy to forget. Chronic dehydration saps performance and makes you feel like a freeze-dried strawberry. Stay fresh, stay hydrated. Depending on where you live, winter can feel interminable. Many people suffer from seasonal affective disorder (or variations on it). It’s easy to overeat. And it’s way less fun to run much of the time. But winter’s downsides are also opportunities. Monks-in-training don’t take vows of silence because they are easy. Meaning is often derived from struggle. So reframe the struggle of winter as an opportunity for running salvation. 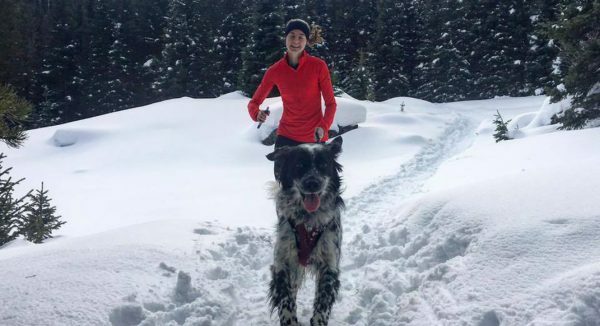 If you can conquer winter as a runner, you can conquer anything—in running and in life. When you are thinking about your running, always think about the three-year plan. Ask yourself the question: what will make me the best, most fulfilled athlete I can be three years from now? Write that question on a post-it note, put it on your fridge and align your daily decisions with the answer. During winter, we write the opening credits to our race season. Stay patient, stay positive and stay motivated. The rest of the show is always worth it. David Roche is a two-time USATF trail national champion, the 2014 U.S. Sub-Ultra Trail Runner of the Year and a member of Team Clif Bar. He works with runners of all abilities through his coaching service, Some Work, All Play. Follow David’s daily training on Strava here, and follow him on Twitter here. Ask the Coach—How Can You Train Like an Elite Athlete Over the Age of 65?